Progress in transportation is stalling as technology lags and suburban sprawl ties things up. Shore-bound drivers in August. "Streets have a certain capacity, and now we've begun to overwhelm it," said a Penn professor. The morning train ride from Chestnut Hill to Center City takes 34 minutes today. Fifty years ago, it took 28 minutes. Today, a United Airlines flight from Philadelphia to Los Angeles takes 6 hours, 1 minute. Forty years ago, the trip took 5 hours, 5 minutes. In 1990, the average travel time to work for a Chester County resident was 23.1 minutes; a decade later, it was 27.5 minutes. In Burlington County, the travel time went from 23.6 minutes to 28.2 minutes. After centuries of ever-faster travel, the triumph of technology over time seems to have stalled. The expectation that each generation will be not only more upwardly mobile, but also more rapidly mobile, has died, apparently of congestion of the arteries. Faster transportation used to be a benchmark of progress: from horseback to train to auto to plane to jetliner, all in 130 years. But for the last half-century, the next Big Thing in transport has languished on the drawing board. The Concorde supersonic jetliner never grew much beyond a Mach 2 novelty for the rich before it was retired in 2003. While "bullet trains" have prospered in Europe and Asia, cruising at 185 m.p.h. and achieving record runs past 350 m.p.h., the fastest passenger train in the United States, Amtrak's Acela, averages only 87 m.p.h. between Philadelphia and Washington. And as technology has lagged, a growing population has overwhelmed the 50-year-old interstate highway network and a World War II-vintage air traffic control system. Add suburban sprawl, environmental concerns, and fragmented land-use planning, and travel tends to become slower and longer. The nation's transportation system has reached maturity - perhaps even old age - and today's efforts are just fine-tuning, said William Garrison, a federal transportation policy adviser to most administrations since Harry Truman's. "We're doing a pretty good job of holding back entropy, but we're tinkering at the margins to get by with what we have," said Garrison, a retired professor at the Institute of Transportation Studies at the University of California, Berkeley, and coauthor of The Transportation Experience, published last year. "What we ought to do is let entrepreneurs do things in new ways." Robert Puentes, a transportation expert at the Brookings Institution in Washington, said the nation had allowed the foundations of its transportation networks to deteriorate, preferring to try to pave its way to happiness. "There's no doubt the nation has underinvested in its infrastructure," Puentes said. "We have done a very good job of building new highways, but when it comes to reinvesting in our infrastructure, we come up woefully short." Some of the results are obvious in the transportation crises facing Pennsylvania, New Jersey and other states. With bridges and roads crumbling and mass-transit agencies such as SEPTA constantly mortgaging their futures to pay bills, the states can't keep up. They are considering leasing toll roads to companies to raise money for transportation projects. In air travel, more passengers, more corporate jets, and antiquated traffic control make trips ever longer, and airlines adjust their schedules accordingly. In 2005, the cost of delays to U.S. airline passengers was $9.4 billion, according to estimates by the Department of Transportation that placed a monetary value on people's time. 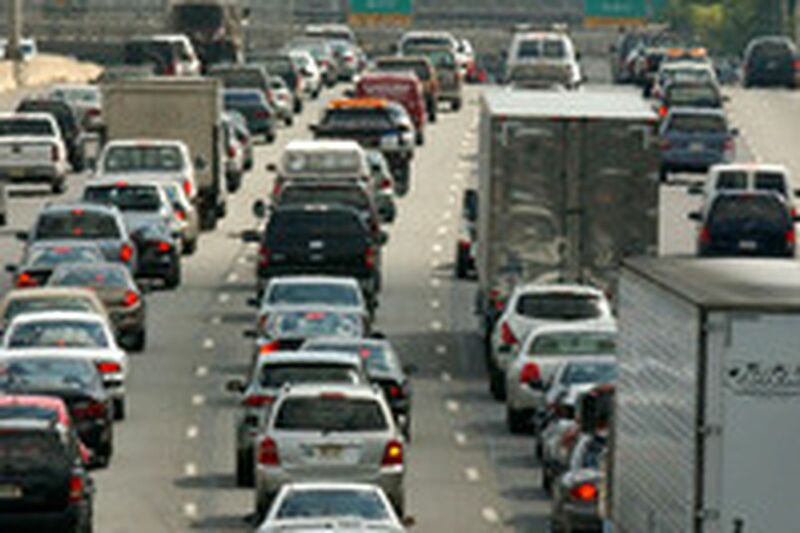 By 2014, delays are forecast to increase by 62 percent over 2004 levels. The air traffic control system "is based on 1950s architecture. It was cutting-edge during the era of Ozzie and Harriet, but not today," James C. May, president of the Air Transport Association of America, told Congress last month. While even backpackers have satellite global positioning system receivers, the U.S. air traffic control system relies on ground-based radar, navigational aids and controllers. "Airways, unfortunately, increasingly resemble many highways - they have become saturated," May said. "What we have come to realize is that the ground-based system that supports point-to-point airways cannot produce substantial new capacity. We have no choice but to introduce new technology to generate needed capacity." Other countries have moved to satellite-based, digital air traffic control systems. Fiji did so a decade ago. Australia, Canada, China, France, Germany, India, Switzerland and the Britain are doing so now. In the United States, the Federal Aviation Administration hopes to spend $10 billion during the next 10 years to plan and begin to put in place a satellite system, NextGen (Next Generation Air Transportation System Integrated National Plan). United spokeswoman Megan McCarthy suggested several possible reasons for longer flights: longer taxi-out times, seasonal differences, and fuel conservation. For railroads, within cities and between cities, the basic technology has changed little in a century, and times for many trips, even in densely populated Northeast cities such as Philadelphia, have increased. In Philadelphia, many SEPTA trains are scheduled to take a few minutes longer than their Reading Railroad and Pennsylvania Railroad predecessors did on the same routes 50 years ago, even as they often stop at fewer stations. SEPTA officials attribute the slower rides to heightened attention to safety. "We are going as fast as we can go with the regulations we have now," said Patrick Nowakowski, SEPTA's chief operations officer. "We're doing things to speed up trips where we can." Tom Dorricott, a SEPTA engineer and union leader, said other factors were at work. He said schedules were padded to improve on-time performance, equipment was old, and train crews were too small to board passengers and collect tickets quickly. On long-distance runs beyond the Northeast, Amtrak passenger trains increasingly are shunted aside for freight trains, and Amtrak's on-time performance last year fell to 68 percent, its worst since the 1970s. The Capitol Limited, which makes the 764-mile run between Chicago and Washington, arrived within 30 minutes of its scheduled time just 11 percent of the time last year. Political, social and administrative barriers are at least as much to blame as technology, said Richardson Dilworth, an assistant professor of history and politics at Drexel University and grandson of the former Philadelphia mayor. "A lot of the bottlenecks are social," Dilworth said. "We could make cars fully automatic, where a driver just plugs in a destination, but auto manufacturers don't think there is adequate demand, so they haven't developed that technology. Electric cars are being bottlenecked by the refueling issue." The United States' postwar focus on cars and highways left mass-transit development to languish, especially compared with Europe and Japan. "Investing in highways is always 'investing,' while investing in mass transit is a 'subsidy,' " said Rachel Weinberger, an assistant professor in urban and regional planning at the University of Pennsylvania who has studied commuting patterns. "I think the area that holds the most promise is high-speed rail," Weinberger said. "The technology is here today. It's a matter of political will." The car promoted suburban growth, as commuters found it as convenient to drive from a new suburb as they once found it to walk or ride a shorter distance. So as people were willing to move farther from work, land-use issues became transportation issues, too. "Streets have a certain capacity, and now we've begun to overwhelm it," Weinberger said. "Maybe we'll find we don't have to live 50 miles from where we work and 20 miles from where we shop." In the meantime, Weinberger said, people persist in two long-standing behaviors: a desire to move faster, and an expectation for a technological solution. "People have always expected to get there faster than they can, and congestion is something people have always loved to complain about," she said, citing an early conference on congestion in 1909. "And they are still optimistic about technology."